Rolex’s reluctant flirtation with the world of quartz technology was not as short lived as the number of pieces it produced would suggest. Starting with the special edition ref. 5100 Beta-21 in the early 70s, a more or less prototype model powered by a consortium-built movement, the brand soon split from the syndicate known as the Centre Electronique Horologer (CEH) and retreated into the depths of their Geneva compound to develop their own quartz caliber. The CEH was a group of more than 20 of Switzerland’s most notable watchmakers, brought together in a desperate attempt to stave of the tsunami of cheap, disposable watches flooding in from Japan and America which had eviscerated around two thirds of the traditional mechanical industry. While the Beta-21, their first mass produced movement, was an impressively precise timekeeping element, the fact that it had gone into service inside 16 different manufacturer’s watches was an anathema to the fiercely independent Rolex. That, as well as the movement being too large and ungainly to be seated inside any of the brand’s famed Oyster cases, the waterproof shells on which they had first made their name, led to a battening down of the hatches while their boffins went to work with the new-fangled electronics. In their usual punctilious way, it took a further five years of development before the first all in-house Rolex quartz movements appeared, the Cal. 5035 and Cal. 5055. Although their hand had been forced when it came to joining the quartz era, and the world’s most successful traditional watchmaker seemed to regard the whole thing as somewhat beneath them, the products of their hard work still stand as some of the most over-engineered and innovative calibers ever made, even by modern standards. When they were released in 1977, they were in a class of their own. In fact, they were so well built and ahead of their time that they are still serviceable by Rolex technicians today, some 40 years after their release. The main key to their success was absorbing the new electronic technology as much as possible into the basic architecture of their industry-leading mechanical calibers. So, rather than trying to reinvent the wheel, or fix what ain’t broke, the entire drive mechanism, including the gear train and pallet assembly, was identical to that found inside the Perpetual Cal. 3035 which was introduced the same year. However, though they may have had a similar blueprint, the differences in their performance was tremendous. 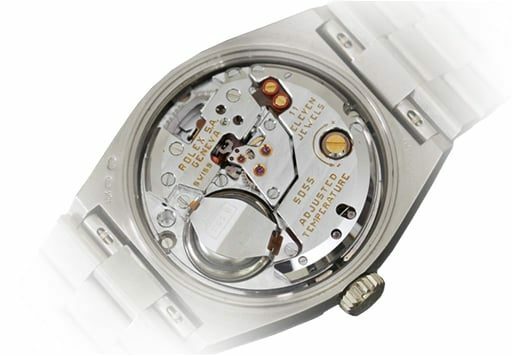 The Oysterquartz calibers, both 11-jewel, 32khz movements, employed an oscillator four times faster than the CEH had fitted to the Beta-21, along with a thermistor, an electronic resistor that regulated the frequency of the quartz crystal depending on the ambient temperature, making it one of the first analogue thermocompensation movements ever made. All told, it made the Cal. 5035 and Cal. 5055 the most accurate calibers to serve inside any Rolex watch. When the second generation was submitted for testing to the Official Swiss Chronometer Testing Institute 18 months later, after the quartz crystal had been changed to a tuning fork shape, unofficial records put them at a mean variation of just 50 seconds a year. At a time when the COSC awarded Superlative Chronometer status to mechanical movements performing within +4/-6 seconds a day, the attraction of quartz as a concept was obvious. In practice however, it was not quite so cut and dried. These incredibly precise engines were put to work in two of Rolex’s most emblematic creations; while the Cal. 5055 powered the Oysterquartz version of the Day-Date, the Cal. 5035 drove the brand’s perpetual test subject, the Datejust. But whereas the names may have been familiar, the look of these new watches was virtually unrecognizable within the Rolex style book. Clearly inspired by the prototype ref. 5100 Beta-21, which had been shaped by legendary designer Gerald Genta, the man responsible for the angular profile of the Audemars Piguet Royal Oak, the ref. 17000 series Oysterquartz Datejust followed a similar pattern. Gone were the brand’s trademark sensual curves, to be replaced by the broad flat surfaces and clunky integrated three-link bracelet that screamed ‘seventies’ as loudly as bell bottoms and Saturday Night Fever. It was a deliberate act, with Rolex insisting that their lovingly crafted and time-honored mechanical pieces should bear as little resemblance to the upstart electronic goings-on as possible. As a manufacturer, they were still gambling on the quartz era being a storm to be weathered rather than an entirely new direction for the watch industry as a whole, and the Oysterquartz references were to serve as umbrellas to shelter under while they waited for the sun to return. Evidence of their almost complete lack of interest can be found in a couple of places. 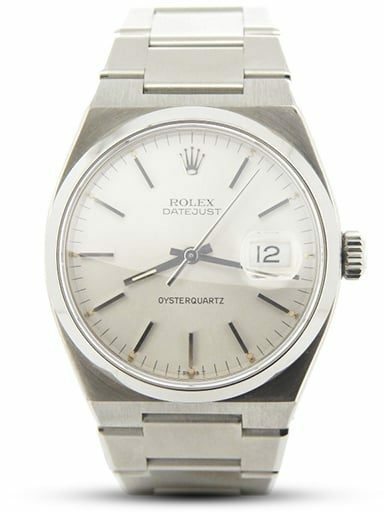 Firstly, although the Oysterquartz watches proved to be commercially popular, thanks in large part to their accuracy and significantly lower cost, in the 24 years between their first appearance in 1977 and when they were eventually discontinued in 2001, just 25,000 examples left the production line at Rolex HQ. For a company that has reportedly produced around a million traditional watches a year for the last half a century, it redefined the phrase ‘bare minimum’. And secondly, their marketing, the only thing Rolex does as well as actually making watches, was decidedly lackluster. The one real attempt they made to push the virtues of quartz onto the public was to outfit mountaineers Reinhold Messner and Peter Habeler with a pair of ref. 17000 Datejusts when they became the first to summit Everest without oxygen in 1978. Neatly bookending with the pre-Explorer models that had accompanied Hillary and Tenzing’s very first successful attempt in 1953, the Messner/Habeler expedition went some way to dispel the notion that quartz watches were inherently more fragile than their traditional counterparts. The Oysterquartz Datejust was issued in three flavors—the fully stainless steel version (ref. 17000) and in both yellow and white Rolesor (ref. 17013 and ref. 17014 respectively). With just 25,000 examples in total split between that trio as well as a pair of all gold Day-Date models, in yellow and white, it is easy to see why these extremely rare pieces are becoming more and more sought after by today’s collectors. That being said, they are still incredibly attainable on the pre-owned market. For a watch that represents such a fascinating part of the brand’s story, coupled with its radical design departure and the only one-tick-per-second Rolex movement this side of the 1950’s Tru-Beat, being able to pick up an excellent example for under $4,000 makes it practically unique. It is the relative anonymity of the ref. 17000 series that has kept its price tag realistic. 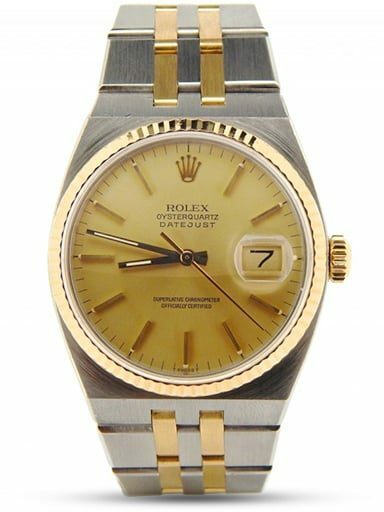 Ask anyone with a passing interest in fine watches whether Rolex ever made a quartz movement and you will be surprised how many people are unaware of them. That is slowly changing these days, as fans and speculators are busy hunting down the more obscure anomalies from the rich Rolex archives, so expect to see an upswing in their value in the coming years. If you were looking to secure yourself a piece of history from the darkest days of the Swiss watch industry, as well as a potentially very sound investment, it would be better to do it sooner rather than later.